Surf BTC is a PTC site that offers both BitCoin and Perfect Money payment options. BitCoin value changes daily but we will endeavour to adjust our Store prices, Ad Values and Payment levels to keep the site at an operational level. 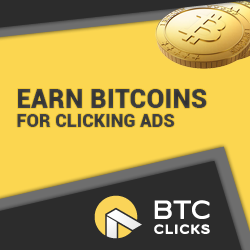 You can earn by clicking PTC ads, Paid to Read Ads, Playing our Clix Grid and by completing Offers. We will review Payment Requests on a daily basis. However, this DOES NOT mean that we will send payments out every day. Members that have shown support in the site recovery will always be given preference. As a Temporary measure we are adopting a term used by many other websites. If you have a Payment Request pending and you have not been active at this site during the last 7 days, your Request will be Cancelled. This will apply to ALL Members. Payments to members that chose not to support the recovery will be sent when funds are available. BitCoin Payments will be sent at the rate set by CoinBase on the day of your payment. We have NO control over this. Payments that are requested to any other BitCoin processor will incur higher fees. Payments to Premium Members are available through Perfect Money, Bitcoin and Altcoins. However, payment will only be sent to the same processor that you purchased your Premium membership with. Any member registering an email address attached to EARN.com will have Admin emails disabled. If the member turns these back on the account will be deleted. Please DO NOT register an account here using Hotmail, Outlook, MSN, Windows Live, Ymail or AOL. You will NOT receive your verification email which means you will not be able to access this site. Failure to do this will result in Payment Requests being CANCELLED until you show your real name. New Members will be allowed 72 hours from joining the site to Verify their Email address. This can be done by clicking on the link that is sent to you during Registration. Members not verifying addresses will have accounts deleted after the 72 hour deadline. If you DO NOT receive the verification email, please contact Admin. Any member that uses an email Filtering service that asks for payment before receiving our emails will be suspended from using this site. You are allowed just ONE account at this site. We do not allow Proxy IP addresses (including Opera). We not allow Corporate IP addresses or Network Sharing Devices. Anyone found breaching this rule will have their account Deleted and will lose ALL earnings! All Sales are Final and cannot be reversed. Please do not ask for Refunds as your request will be declined. We reserve the right to delete a Member Account for any of the following reasons. 1. Anyone found or considered to be Cheating. 2. Any Member that is abusive or sends threats to Admin OR other Members. 3. Any Member seen to be posting detrimental comments about Admin or the Site on external Forums or via Emails. Any Member found to be using multiple addresses for either BitCoin or Perfect Money will have their account Deleted without Warning. All funds will be lost. Please note that we do not Guarantee activity from Referrals that you purchase at this site. However, at the time of purchase, all Referrals have been active at the site within the last 7 days. We will try to keep our Terms of Service as simple as possible, but over there will be a need to make changes and additions. This can happen at any time, although we will try to notify Members whenever it does.